Nearly 300 people took to the streets of downtown Winnipeg on Valentine's Day in honour of missing and murdered Indigenous women and girls. 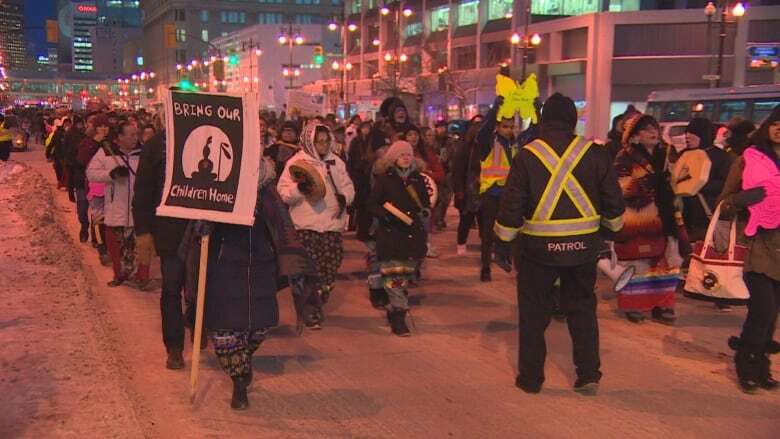 Hundreds marched in the streets in Winnipeg on Valentines Day night — showing love for missing and murdered Indigenous women and girls and the families they've left behind. Many carried posters of cutout butterflies, with the names of their loved ones, along with the date they disappeared or were killed. "I'm walking tonight for my sister," said Kelly Ducharme. "She was murdered three years ago, on Feb. 6, 2016." "She was a great, loving mother, who left six children behind," she said. "Everybody deserves justice. Walks like this are a good way to show support for everybody." In cities across Canada, families of murdered and missing Indigenous women, girls and two-spirited people have marched on Valentine's Day for more than a decade to call for justice and try to drum up tips in their cases. "We're walking for everybody," said marcher Angela Lavallee. "We're walking for women. We're walking for Indigenous women and girls that are still here, that still need to be heard, that are not being heard. "We are walking for our community and we're walking for our loved one: My granddaughter," she said. "She died in April 2015, and we have suspicions as a family. Her death was deemed 'undetermined.' And there was no thorough investigation," she said. This was the 11th year the march has been held in Winnipeg. Earlier on Thursday, about three dozen people gathered at Brandon University for a ceremony and vigil, as part of the school's Indigenous week activities. Tina Cook-Martin, the university's Indigenous Student Success Officer, said she's seen the effects of the MMIW crisis first-hand. "I've heard personal stories. You hear stories all the time like that. It does take an effect on me because I am Indigenous and I am a woman. So there are things I have to be considerate for." Cook-Martin said she appreciates the support shown by Brandon University and the community in general, which is key to making sure people don't forget about those who have gone missing or been killed. "Even if it means participating in events such as this or sometimes people do walks and awareness throughout the community. So I feel that if they participate and spread awareness and even talk about it, that would help as well."